The upshot was that more poorly performing male players were more inclined to direct negative comments at the female-voiced player. That is, sexism was related to losing. Now I think that is an interesting result and the experimental design was a clever way to collect real data on online behavior in an a male-dominated environment. We argue that a clearer understanding of sexist behaviour can be gained through an evolutionary perspective that considers evolved differences in intra-sexual competition. We hypothesised that female-initiated disruption of a male hierarchy incites hostile behaviour from poor performing males who stand to lose the most status. To test this hypothesis, we used an online first-person shooter video game that removes signals of dominance but provides information on gender, individual performance, and skill. We show that lower-skilled players were more hostile towards a female-voiced teammate, especially when performing poorly. 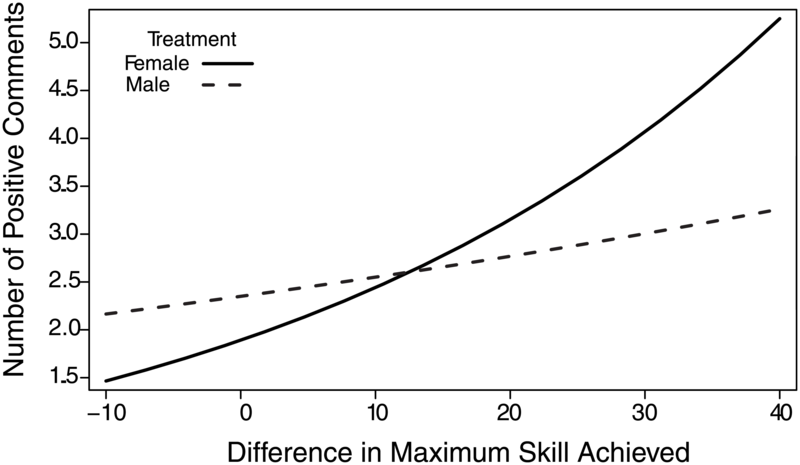 In contrast, lower-skilled players behaved submissively towards a male-voiced player in the identical scenario. This difference in gender-directed behaviour became more extreme with poorer focal-player performance. That all seems rather forced. Alternate socially-constructed viewpoints of sexism would also recognize that individuals will perceive a degree of relative status in such social situations. Given that and given the very obvious presence of sexism it is not surprising to find actual instances of negative comments being generated by men who are doing poorly in a game. That isn’t to say their research doesn’t help support their perspective, but it doesn’t particularly support it more than the alternative.